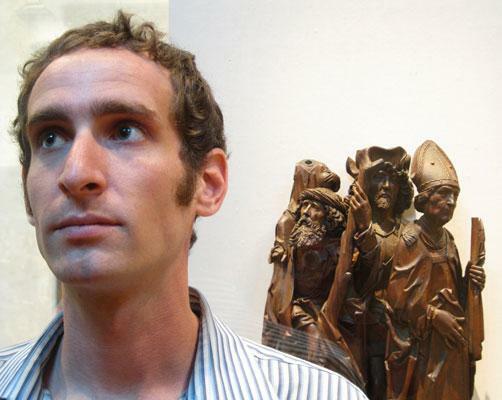 Doug Balliett is a prolific artist whose career has spanned classical performance, composition, rap, rock, spoken word, period performance and conducting. As a double bassist he has performed with Alarm Will Sound, Ensemble Modern, the Ensemble Modern Orchestra, the San Antonio Symphony (principal and assistant principal) and the Metropolis Ensemble. He has earned fellowships at Tanglewood, where he performed as principal bass under James Levine, Aspen (principal under Jane Glover), National Orchestral Institute (principal under Andrew Litton) and the Lucerne Academy (principal under Boulez). He also maintains an active life as a recitalist, including live radio recitals, solo recitals throughout New York, and recital tours. Recent engagements have included double bass concerto performances at Alice Tully Hall and the ACFNY, commissions for new works from SOLI San Antonio and New York’s The Millenials, and tours with his band The Oracle Hysterical in Germany and Switzerland. Mr. Balliett’s compositions have been heard throughout the US, garnering several awards, including prizes in the Frederick Delius Competition, the Leonard Bernstein Scholarship, the Kirkland House Music Award and Harvard’s first annual Artist Development Grant. Recent compositional projects include a late-night events at the Chelsea Art Museum (as part of his continued residency at the Chelsea Music Festival) and the composer-in-residence Spotlight with The Oracle Hysterical at the Lucerne Festival, where he and his collaborators presented an evening of Grimm songs and a new hip-hopera based on Melville’s Billy Budd. Mr. Balliett graduated from Harvard in 2007 with high honors and is recently completed a master’s at The Juilliard School in Historical Performance. This Saturday's New York Phil Biennial finale features Danish composer Per Nørgård. Join us for a primer on his music today at 3 pm. This week the Brothers Balliett present two works, somewhat bizarrely paired, that both have great viola parts: Wolfgang Rihm's '"Fetzen", and Paul Chihara's "Viola Concerto". What do American composer David Brynjar Franzson, Romanian-German educator Adriana Holszky, and accordion virtuoso Teodori Anzelotti have in common? The Brothers Balliett know. This week the Brothers Balliett take a look at two composers with....well...let's say "unusual" approaches to piano composition. Listen Thursday at 3 pm. A few weeks ago we looked at early Philip Glass – music that exemplified what came to be called minimalism. Today: two composers that spun off the genre in their own distinct ways. To shake off the sludge and snow from their boots, this week the Brothers Balliett hit the dance floor with two major figures of American music: Philip Glass and John Adams. This week the Brothers Balliett take a gander at three utterly unique piano pieces, each designed to honor a specific person or set of people. We all know Philip Glass as the composer of countless film scores, a Beethoven-sized collection of symphonies, and a host of amazing operas. But what was his early work like? Per Nørgård's formidable output places him within the symphonic tradition of his regional predecessors Carl Nielsen and Jean Sibelius, but also shows him breaking new ground. It's been a warm set of holidays, but that doesn't mean we can't set a reflective and introspective mood with some new music that perfectly encapsulates the spirit of the season. To celebrate this mild beginning of winter, the Brothers Balliett share two stunning chamber works to set a contemplative tone for the Holiday season. There are many fantastic musicians for whom playing an instrument is not enough – these musicians must create, and some of them turn out to be amazing composers. Are you hungering for some fresh and imaginative pieces that feature the trombone, that most unusual of brass instruments? Join the Brothers Balliett Thursday at 3 pm. Do you think the woodwind quintet is played out? This week, the Brothers Balliett set out to restore your faith in this unusual combination with some amazing contemporary works. What could be a better mid-summer treat than a survey of some of the most exciting string quartets working the field today? Join the Brothers Balliett Thursday at 3 pm. This week the Brothers Balliett delve back into the world of Arthurian legend with the third and final installment of Harrison Birtwistle's brilliant opera Gawain. Gather the whole family around the speakers and put on Q2 Music – this week's show features three works geared for the younger crowd of up-and-coming new music fans. How Do We Write a Song Today? The art song tradition is as alive and well as ever, from Rihm to Roche. Thursday at 3, the Brothers Balliett take a look at the kinds of songs composers are producing today. Continuing their series of composer portraits without alerting the "portraitees" ahead of time, the Brothers Balliett explore the music of ex-pat composer Nancy Van Der Vate.